This is the best ever Taco Pizza made with my Spelt Pizza Dough Recipe with spicy marinara sauce. The clean eating pizza crust is made with Spelt flour, which is one of my favorite Clean flours. I think you will be happy with how it is probably different from your regular pizza yet similar tasting similar to the food you regularly eat. I first tried taco pizza about 20 years ago when I was working for a lawyer and his wife suggested we get taco pizza from Pizza Hut. I had never heard of such a thing. It’s not on the menu, but apparently – at least at that time at that Pizza Hut in Casper, WY – they would make it for you on request. It was so good. I still don’t understand why they don’t make it a regular menu item. 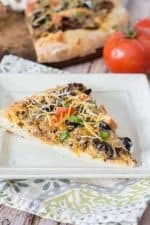 I like to make this taco pizza made with spelt pizza dough at home regularly because well, I don’t like most pork meats. I don’t like sausage, pepperoni or ham. Plus, those things really aren’t all that healthy. Plus, it’s fun to have a variety of food. I think as a general rule, that ground beef is a lot healthier than the cured meats I mentioned above and, because of the spices, this has a lot of flavor so you don’t miss the more fattening meats. 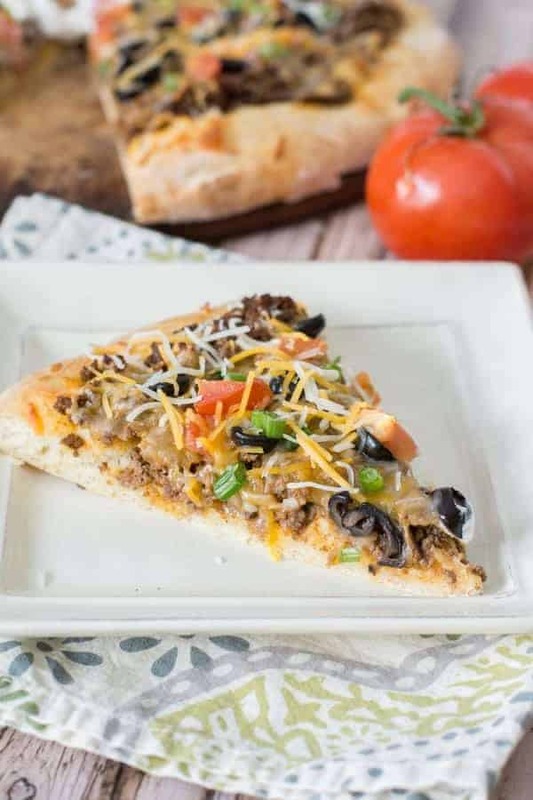 I especially love this pizza with grass-fed ground beef from U.S. Wellness Meats. It’s so much healthier for you, it comes to your door and it costs less than the grass-fed beef at my grocery store, as long as I buy a lot all at once. This is my personal favorite and I usually buy 40 pounds at once so I get the quantity discount and the 40 pound $25 discount. Then I fill up my freezer for a few months. 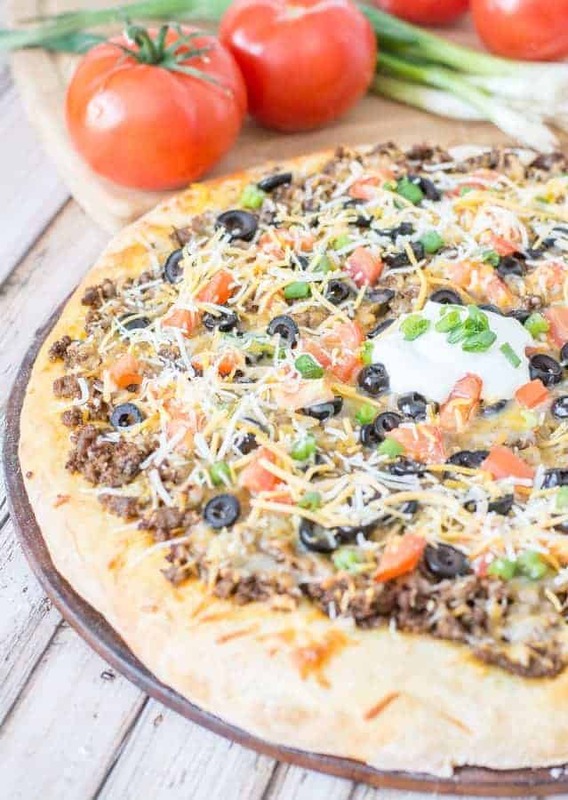 Plus, the biggest thing about this homemade taco pizza recipe is the FLAVOR. I mean, Hispanic food can be really delicious and, granted, this is very Americanized, but it’s flavorful and has a lot of flavors going on in each bite. Plus, it puts two of my children’s favorite foods together = win-win. I mean, almost all children love pizza and tacos. What is your favorite type of pizza? I actually like Canadian bacon and pineapple – but even better is bacon and pineapple. Bacon is one of the cuts of pork that I actually do love, especially if it’s uncured. I think with Canadian bacon and pineapple you either love like or you hate it. Oh, another variation of this recipe is to put shredded lettuce on top and some sort of dressing, like ranch, tomatillo ranch, salsa, tomatillo salsa, etc. I mean, really just make it how you like it. It doesn’t have to be beautiful. It just has to taste good. Whatever you put on your pizza make sure you use this spelt pizza dough recipe. 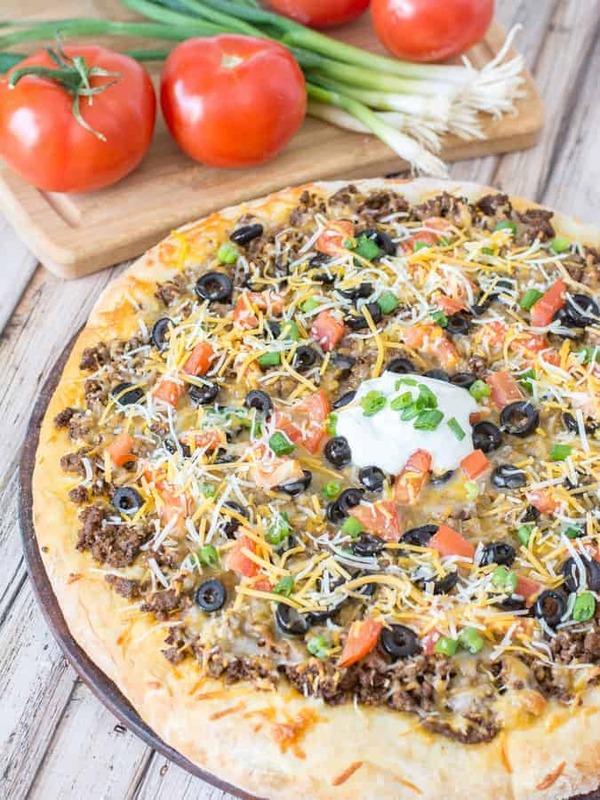 Have you ever tried or even heard of taco pizza before? Do you know if Pizza Hut or any other chains make taco pizza? Is Pizza Hut even open anymore? I haven’t seen one for a long time and it’s not like it’s the kind of place I would go looking for now that I eat Clean. I am wanting to make this recipe, but I am confused about the spicy marinara sauce. It says recipe below, but all I see is step #9, which states to combine all ingredients in a saucepan and simmer. Is this the recipe? Using which ingredients? I assumed it was the marinara sauce, chili powder and red pepper flakes, but we would have already spread marinara sauce on the crust at this point. Does this then get drizzled over top of the pizza after it bakes? Thanks for the clarification and help! Thanks so much for pointing that out. I read back through the recipe and was like wha…huh? so I adjusted the instructions so they make sense (hopefully). Please let me know if you try the recipe. Thank you for the clarification! I made it soon after my original post and just guessed. It looks like I did it correctly! It was very good and we will be making it again. Thank you! You’re welcome! I’m glad you figured it out. I’m always so behind on my comments. . . I just get so many it’s hard to keep up. Looks like a great recipe. Do you share nutritional info? It took me forever, but I finally added the nutritional information to all my recipes.